It’s been pretty hot here the past week or so, and unfortunately our AC stopped working 7 days ago. The repairman is coming tomorrow – as you can imagine this is a very busy time of year for AC companies and we had to take what we could get! The upstairs is about 90 degrees right now, so needless to say I haven’t spent much time in the sewing room. However, I have been hitting up the thrift stores to get out of the house and enjoy someone else’s AC for awhile. Good thing, I did! People are doing a lot of spring cleaning right now and so there are some great deals out there. The first piece is a wonderful little sewing caddy that for any UFOs. 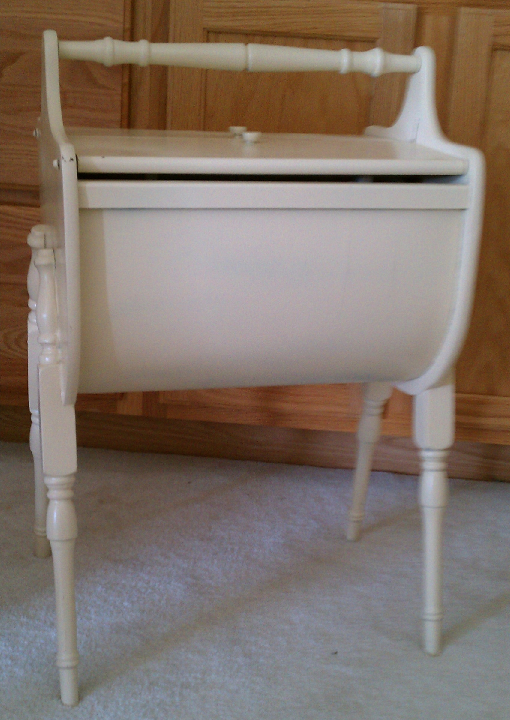 It’s a perfect fit next to my sewing chair – just haven’t had a chance to sit down with it yet. Here is a cute little shelf I found at Goodwill. 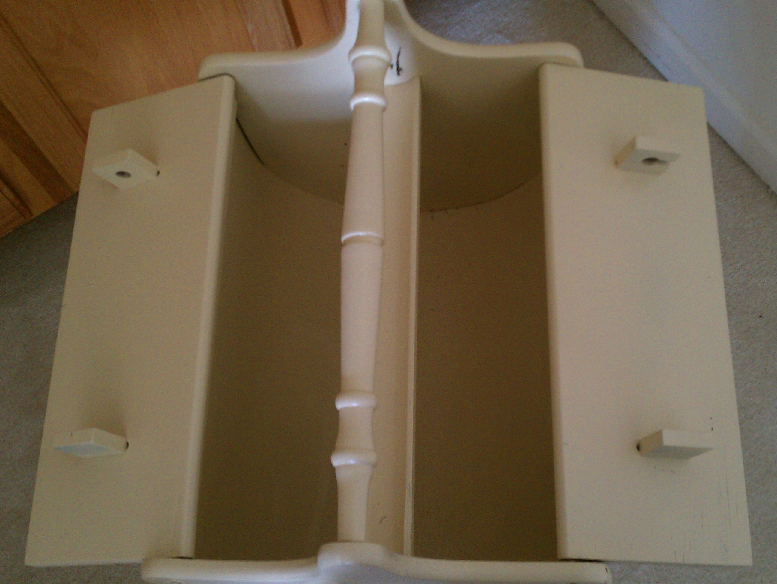 Each shelf can be removed and used as a tray. Also, the little “fences” around the shelves can be removed for a different look. No sewing room is complete without a bunch of containers for all your sewing treasures! Who knows what will actually go in them, but they sure look cute. First is set of Mr. Peanut jars from 1980. My grandmother used to go through these peanuts like crazy! 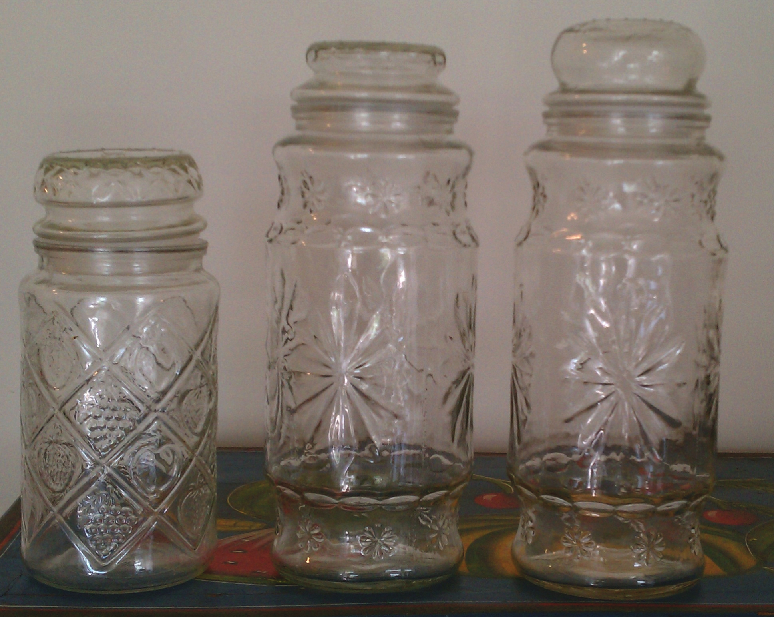 Who knew the jars would become collectibles! Next is a set of wooden canisters with roosters on them. These were very popular in the 1950’s. I think there was probably a fourth canister (a larger one), so you had one each for flour, sugar, coffee, and tea. I have such a good time seeking out these bargains and treasures – wish I could do it full time! I never find goodwill treasures like you do, you have excellent luck! Jen, we need to go together! One piece of advice is that you have to make the circuit on a regular basis. You have to be there to get the bargains when they are put out. Sorry about the AC. Remember Granny has some anytime you would like to use it and a lot of thrift stores just waiting for you. I love the new purchases and can hardly wait to see everything put together. Is this offer to all my blog fans? I know a few people who would enjoy taking you up on this :). Heather – great finds! Sorry about your AC also, that stinks! It has been darned hot..I hear ya!! Great finds btw. We are enjoying looking at your thrift store finds. We found a sewing box in our mom’s attic like the one that you have pictured. She thinks it is from the 1950s or 1960s, but not sure. Do you know what year, or approximately what year this box is from? I’m glad you like my thrift store finds. I need to post a new entry on that soon! I’m not sure how old my sewing box is, but I do think it would be from the 50s or earlier. Thank you for your response. My mom didn’t think it would be earlier than 1950s, so hopefully someone will be able to tell us!